Crime Rate Decline connected to gaming? Thread: Crime Rate Decline connected to gaming? The per capita murder rate in the United States is about six times that of Japan&#39;s.
Over the last 10 years in the United States, the violent crime rate declined by 41% and the property crime rate fell by 32%. To me this coincides with the rise of video gaming. Is there a connection with video gaming and reduction of violent crime? Considering most crime is committed by young individuals it&#39;s worth a study I believe. So should society thank the video gaming industry? On the surface, 1 = 1 and it seems logical that if a person is exposed to violence that they will become violent. But maybe what society should recognize is that the potential for violence already exists in all of us, and that gaming is a sort of pressure release valve. Ask yourself this question: Is it better for an individual to brood over something that is upsetting to them, or have them engage in an activity that 1) is part of a larger community and 2) allows them to vent suppressed frustration that they might not otherwise recognize as a potential problem? And yet, the anti-game laws keep coming. One would think thereâ€™s an epidemic of violence in this country. 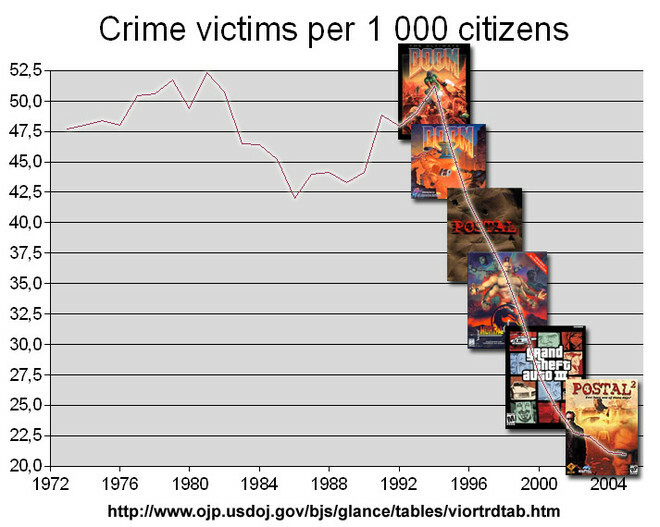 One would think that as video games have grown in popularity, violent crime has gone up. hmmm, maybe Bad Company 2 should be a required course in High School. In reality, I know no one wants a society that is rot with violence, on the real streets that is, but in the same spirit one has to consider the circumstances of every individual and that no society can keep track or somehow influence someone&#39;s behavior by pretending to present a perfect world (i.e., eliminate all influences and white wash the world). Therefore it seems to me that allowing avenues, like video gaming, to help individuals vent their most natural feelings is actually a good thing. I know I don&#39;t want my child to be involved in some stupid real world crime when they grow up, and will do my best to help them get in touch with their feelings and find ways to help them shed the negative ones as quickly as possible so that the positive one&#39;s will be more of an influence on their real life. Of course I believe this and that&#39;s why I had proposed the HunterBean VideoGaming Cafe concept, which I still hope will become a reality some day. There are neighborhoods that could use video gaming as a positive influence on their communities imho. Another interesting article that actually shows when games are released there's a drop in crime. And, year after year there's a drop in crime compared to the previous year. This is the concept behind our Centerz4Gamerz, to bring community gaming, comrade-manship and the rest into disadvantaged neighborhoods and put kids back on the right track.